Haha, WOW. Here’s one we’ve been promising, gosh, for at least two years! I literally have no idea why it’s taken this long to do; mostly I’m just a lazy farker, but you know. And if you enjoy this one, THERE’S FOUR MORE (!!!) WHERE THAT CAME FROM. (Maybe we’ll get to them in short order; maybe not. Melly’s already scanned them in!) Anywho, please give a GREAT BIG ROUND OF APPLE SAUCE (you heard me) to ZippyZippy for typesetting, Tom the Mighty for editing, and Melfra for scanning. Translation by yours truly as always, but don’t you dare give me applesauce; I hate that stuff. Tomorrow…! Actually, I haven’t decided what we’re releasing tomorrow. IT’S A SURPRISE, THEN! 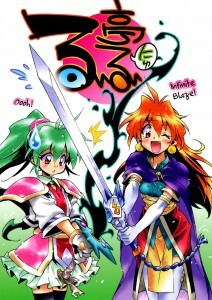 11 Comments on "Twelve Days of Doujinshi, Day 4: When in doubt, count on Lina Inverse!" I’m so happy to meet you guys in this year. Thanks GOD! Omg girl <3 ????! ????? Pardon the excess of caps; I’m really excited. Eh? Why does mine have a “warning” on it…? What’s it warning you of? Actually, the “warning” isn’t there anymore. They were visible on each post, but not anymore. Thanks for the info! (I marked the comment as private, not hiding anything, just for future reference). The problem should be fixed now. Looks like the feature we had which allowed users to edit their comments is no longer compatible with this version of wordpress. I’ve deactivated it until the issues is resolved. Thanks again! Sure, happy to help! And thank you very much for the new release today.